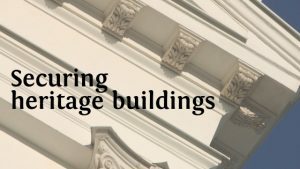 A “heritage building” possesses architectural, aesthetic, historic or cultural values which have been declared by a planning authority/heritage conservation committee. Renovation to this type of building requires special attention, processes and permissions. More often than not work, will need to be completed by niche experts; specialised insurance cover and planning permission must be obtained for even the most minor of alterations. The same can be said for security. Heritage buildings will always present a vulnerable risk. They are high-value targets for burglars; with an estimated £100 million of artwork and sculptures being stolen from historic buildings in the UK each year. Risk is further enhanced by the mere nature of these sites – they are there to encourage access by the general public, to view priceless artefacts and historic paraphernalia. For these reasons, securing a heritage building can present challenges. The strict rules governing these properties, and what is permitted, can make it complicated or costly to put an effective system in place. Unobtrusive: Reach the agreed objective with a low impact on the property. Installing a security system should not cause unnecessary disruption or damage during installation or future maintenance. All work should be essential and justified with a risk assessment. Comply: Does the security system comply with all legalities? As well as the usual considerations do they meet listed building requirements? Reversible: Changes to a heritage building should be easily reversible. Sensitive: The overall appearance of the property is key, this should not be compromised in any way. Existing features can be used to conceal cabling and camera positions should achieve a fine balance between discreet and noticeable. Beware: Choose experienced suppliers and contractors. As with any security system, the main aim is to prevent intruders by creating an impression that the building is difficult to access. This can be achieved using perimeter fencing, security gates, well-made doors and windows with a suitable access control system, subtle signage/warnings and visible control measures where suitable. If your latest project is a heritage building contact us to discuss your requirements. Our team of knowledgeable experts can devise a compliant security scheme tailored specifically to your needs. Also take a look at our Pitzhanger Manor project – finalist in Security and Fire Excellence Awards 2018.